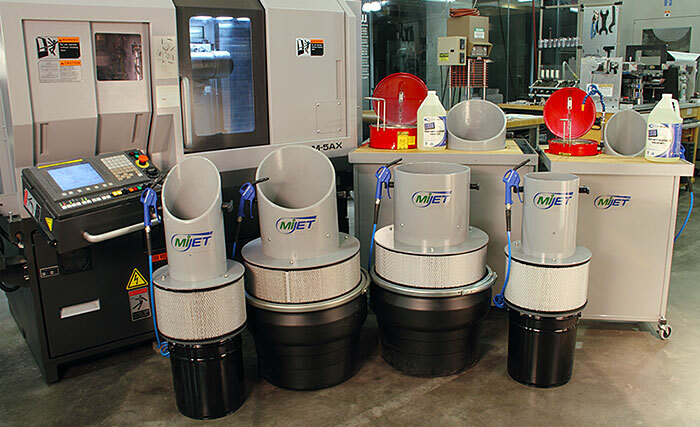 MiJET units, powered by air, are used near CNC machines or inspection stations to clean oily residue and chips from parts, they capture that residue with vacuum into a container for recycling. Our patented valve allows an operator to pull the trigger on an air nozzle which simultaneously actuates both an air jet and suction. The air jet allows localized cleaning of parts, while the suction pulls the atomized fluid particles and chip residue downward into a removable container below. MiJET should be a key part of your company's Environmental Health and Safety strategy! Watch this video to learn the MiJET story. The typical method used in shops is spraying air from an air nozzle over parts, creating oily aerosol which gets inhaled and eventually settles all over the floor. (4) expensive coolants are captured for recycling. All of these problems solved with no electricity required, just an existing shop air line! Portable, with a small footprint, the unit can easily be installed next to each CNC machine while still making valuable shop floor space available for other operations. Options include low noise air nozzles, parts baskets to hold various part sizes during cleaning, castors for easy relocation, workstations and wash stations. If there isn't a MiJET that fits your parts or application we can custom build one for you! 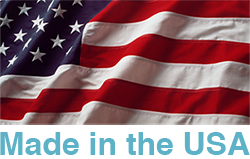 All MiJET units are "Made in the USA". The MiJET® system was designed and developed by Custom Service Solutions, a company with years of experience solving problems in the manufacturing industry. Our team of experts specializes in custom CNC machine installations of fire suppression, air purification, and tool monitoring systems across the nation.